Each day, you go to work to do a job. You expect to work in a safe environment. This is your right under New York law. Yet, accidents happen. For some reason, you suffered an injury or contracted an illness while working. Now, you are facing a stack of medical bills and potentially the inability to go back to work. You’re worried. What should you do now? Before you settle any workers’ compensation claim, your goal should be to contact a Schenectady workers’ compensation attorney. Doing so can help to ensure your rights are protected. If you are looking for help right now, before settling a claim, we are happy to help you. 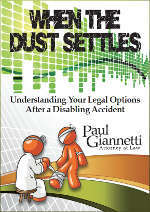 Paul Giannetti Attorney At Law encourages every individual suffering from any type of injury or illness that is job-related to seek out legal assistance before moving forward. When you are hurt on the job, the first step you should take – after receiving medical care – is to alert your employer about the incident. He or she is then tasked with the responsibility of file a claim with the company’s workers’ compensation plan. However, filing a claim is an initial step. You are reporting what happened. You should not, however, settle that claim just yet. In Schenectady, many of our clients often talk about how much they love their employers. They want to go back to work. It’s true that much of the city is made up of small businesses as well as restaurants and retailers. You may work for the hospital system or even the area’s schools. With thousands of students enrolled in Schenectady City School District, you just want to go back and help them. Or, for those who are working along the marina – you may just want to get back out there. That is important, but you need to ensure that you receive all of the compensation owed to you. That’s complex. Let’s explain. What Type of Compensation Are You Owed? Under New York law, you are entitled to compensation for any losses you incur as a result of being hurt on the job. This may include your initial medical bills (that includes the visit to the ER or hospital as well as any initial doctor’s visits). You may also realize that you need compensation for the few days you missed work. But, that’s not all – if you file a claim for just this, you may be missing out. Instead of settling your claim quickly after suffering these losses, work with a Schenectady workers’ compensation attorney first. Our goal is to help find any areas where you may need additional financial help. For example, you may need to go to physical therapy for a few weeks to get range of motion back. You may need to spend some time in a rehabilitation center. Some people suffer from injuries that create chronic pain. You may need a chiropractor to help with that or more physical therapy. Many people struggle with long-term loss, too. This may include the loss of a limb. It may also include a fatal incident. In short, all of your losses should be a part of your settlement. This is not something that your employer has to pay out of pocket. Rather, the workers’ compensation policy will cover the losses. You should never feel bad about making these claims, especially since they are rightfully yours to make. In our small community of around 66,000 people, one thing is for sure. Most people work very hard to earn a living. You may work along the waterfront or in the local casino. You may have a job in one of our new hotels. However, if you are unable to work, it is going to be financially difficult. And, for that loss, it is best for you to have the financial support that is owed to you. When you work with Paul Giannetti Attorney At Law, and our legal team, it is our job to help ensure that you file a claim that is thorough and includes all of the potential losses you have suffered both initially and in the long term. This way, you can get the care you need and get back to your employer or just get back to living life without worrying about what you’ve lost. Remember, employers cannot discriminate against an injury claimant – that gives you even more protection. Workers’ compensation claims are very serious. Mistakes made here can lead to costly losses and limited access to the compensation owed to you. We encourage you to contact our legal team to discuss your case in full. We provide a free initial consultation. Utilize our years of experience and solid successes helping others like you overcome their financial loss through workers’ compensation claims. Call us at 866-868-2960 or use the form online to contact us now.